The rewards for wandering around without a plan can be enormous, and after a long while of knowing about this piece I eventually found it quite by accident when I decided to walk down a street I rarely visit. It is by the magnificent Tim Marsh, who I think lives in Barcelona, and who was a visitor to Upfest 2018. As with many artists who come to Bristol for the festival, Tim Marsh gave the city with this little ‘present’, and very kind of him to do so too. This piece looks like it might be the Queen wearing a kind of colourful Banksy mask… it could of course be something else completely. Typical of his work are the colourful geometric patterns that fill the space around his subjects. Thank you Tim. I’m glad you finally found it . . . I was thinking that it was a QEII cross over with Planet of the Apes! I see what you are saying there. Always nice when this kind of thing happens. Like the Planet if the Apes insight. Perhaps a bit of the Simpsons, in the eyes and Chewbacca, bandolier along with QEII. 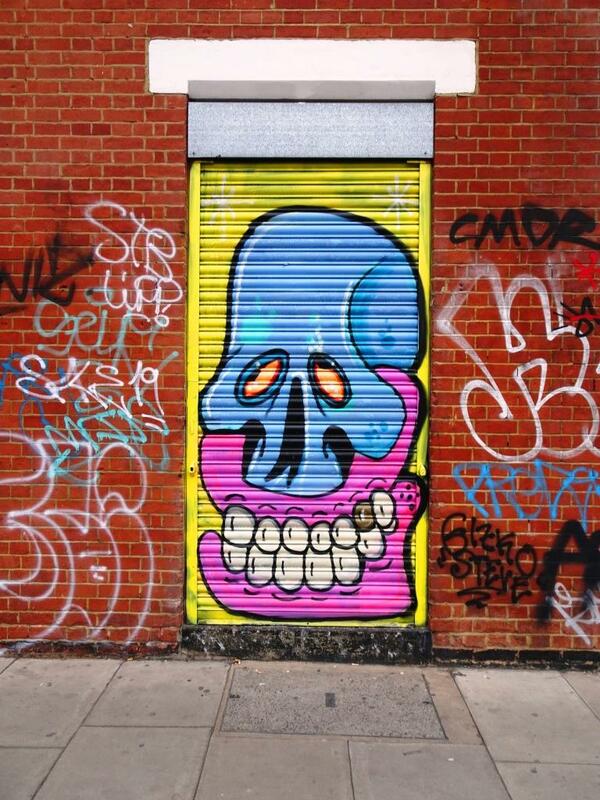 I thought there was a Simpsons thing going on with his Upfest piece, but Tim Marsh said it was a Banks mask.